January 12, 2010 - A criminal complaint has been filed against Joseph Hedlund Johnson, 56, of Salem, Oregon charging him with the federal crime of interference with the performance and duties of a flight crew member or attendant. Johnson surrenders to authorities on Monday, January 11, 2010 and appear before U.S. Magistrate Dennis J. Hubel at 1:30 in Courtroom 9B. The crime of interference with the performance and duties of a flight crew member or attendant carries a maximum penalty of 20 years in prison and a $250,000 fine. 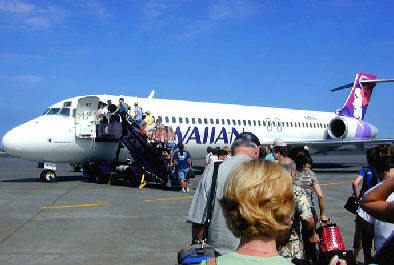 The complaint and supporting affidavit allege that Johnson and a traveling companion boarded Hawaiian Airlines Flight 39 on the morning of January 6, 2010, destined for Kahului, Hawaii. It is alleged that Johnson, after boarding the flight, became upset because he was not allowed to place his bag under his seat. The Captain read the card and locked the flight deck as a precaution. He told investigators he felt threatened by the contents of the card, especially when he considered Johnson’s earlier suspicious behavior with his bag. After speaking with the flight crew about the incident, the Captain decided to declare an emergency and return the aircraft to Portland. Two Oregon Air National Guard F-15 Eagles, under the direction of North American Aerospace Defense Command, scrambled on Wednesday when the pilot of a commercial airliner reported having a disruptive passenger on board. The F-15s, stationed at Portland Air National Guard Base, piloted by Air Guardsmen assigned to the 142nd Fighter Wing in Portland, immediately jumped into action after receiving notification from the Western Air Defense Sector, part of the Washington State Air National Guard at McChord AFB, Wash. The pilots were alerted that there was a problem aboard Hawaiian Air Flight 39, and within minutes they had visual airborne contact with the Boeing 767 that departed Portland International Airport bound for Maui. Lt. Col. Mark Dunham, one of the F-15 pilots who shadowed the airliner back to the airport, said the event was a textbook example of what effective communication can accomplish. "Once we were airborne, the coordination between WADS, air traffic control and the FAA was stellar," he said. "Everybody did exactly what they were supposed to do, and it made our job easy." WADS officials did not take the notification lightly. "Although we didn't know exactly what kind of disruption was happening aboard the airliner, we made our decision to launch jets based on the information we were receiving from the Federal Aviation Administration," said Col. Eric Vogt, WADS director of operations. "It's always better to err on the side of caution by scrambling fighters and take any air threat seriously." The F-15 pilots escorted the aircraft until it landed at Portland International Airport without incident at about 1:15 p.m. PST, where the plane was met by law enforcement and Transportation Security Agency officials. The Oregon Air National Guard's 142nd Fighter Wing Airmen are assigned the air sovereignty alert mission and guard the Pacific Northwest sky from northern California to the Canadian border on 24-hour alert as part of the North American Air Defense system. A component of the North American Aerospace Defense Command, the Continental U.S. NORAD Region directs air sovereignty activities for the continental United States. Since Sept. 11, 2001, CONR has been the lead agency to protect the U.S. from further airborne aggression from inside and outside America's borders. "The (aircrews) from the 142nd FW performed magnificently as one of the premier air sovereignty alert sites in our nation," said Maj. Gen. Garry Dean, CONR commander. "Their ability to respond in near-record time to a potential threat in our skies demonstrates the dedication, professionalism and agility of these highly trained aviators."